This article is part of a year-long feature - watching and blogging about twenty acclaimed, cult, challenging and rare films over the course of 2013. The full list of films can be found here. 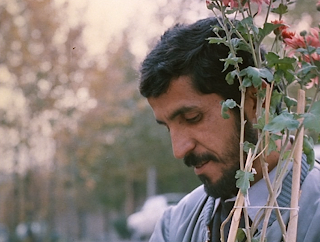 Hitting a quarter of the way through with the formal complexities of Abbas Kiarostami's Close-Up. I confess to being a latecomer to the filmography of Iranian master Abbas Kiarostami. Indeed, until viewing Close-Up I'd only seen his two most recent (and excellent) works Certified Copy and Like Someone In Love. One thing that has struck me on these early encounters is Kiarostami's unique sense of cinematic time. Scenes regularly take place in a sort of real-time - whether that's the extended taxi trip of LSIN or the lengthy, flowing philosophical conversations of both films. Of course, all of this is heavily compressed to fit the remit of a standard feature film, and traditional editing techniques are adapted to jump in space and time as required. But Kiarostami is a wonderful illusionist, persuading us that we're watching things play out in a 'reality' similar to our own. His ability to allow sequences play out at their own dreamy pace is one hallmark of a director whose films I have thus far found completely bewitching. Close-Up is no different. The film opens with a Kiarostami signature scene - an extended in-car conversation, this time between a taxi driver and journalist as two silent policemen sit in back. The rhythm of this scene is natural, a flowing and believable dialogue. This rhythmic style is often prevalent in the film, particularly during the courtroom scenes, where revelations and insights are reached at their own pace. Soon after the opening conversation, however, we're witness to one of the film's most famous images - a long shot of aerosol can slowly rolling down a hill. Again, we're watching something in real-time where another director would cut. But Kiarostami's intention here is somewhat different - drawing attention to the inherent unnaturalness of cinema, playing on our expectations by not cutting to something else as pretty much any other director would. Indeed, later in the film we retroactively are shown the more 'exciting' situation playing out mere metres away in the compound. In a film like Close-Up, emulations of reality - however effective - are always just emulations, and the director is constantly reminding us that what we're seeing on screen is a fully mediated, manipulated world. Such an approach would almost be contradictory if it wasn't for the formal mastery of the mediator. It's accidentally appropriate that this film was the one I ended up watching and writing about after Chris Marker's Sans Soleil as they both serve as meditations of a sort on the very nature of cinematic images. Whereas Marker's freewheeling audio-visual essay often comments directly on the manipulation of images, Close-Up offers a different approach where the viewer is constantly invited to question the lines between fiction film and documentary. Kiarostami is a director who shows true trust in his audience and allows us to negotiate this peculiar divide with a bare minimum of hand-holding. The film focuses on a 'true' story - Hossain Sabzian's strange impersonation of Iranian filmmaker Mohsen Makhmalbaf. In the sense that all the major players are represented by themselves, the film certainly shows elements of documentary filmmaking. But this is rather complicated by recreations and the omnipotent albeit off-screen presence of Kiarostami himself. If ever a film defied arbitrary classification it's Close-Up and its ever-shifting identity. Even wikipedia's 'docufiction' tag doesn't seem quite right. When we watch the court case in Close-Up - and we spend a considerable percentage of the film in that confined Tehran courtroom - we're watching the actual court case unfolding. And yet it's nowhere near that simple - Kiarostami has (on-screen) negotiated with the judge to allow him and his crew both film and sway the ebb and flow of Sabzian's 'trial'. It's a bizarre setup, and how unusual it must have been to be a fly on the wall during filming! Kiarostami smartly uses grainy 16mm stock to differentiate this footage from the more traditional 35mm recreations of previous events, and even this simple aesthetic choice further muddies the parameters of truth. Odd though this all may be, the artistic dividends are plentiful. Sabzian's passionate, deeply personal reflections on his motivations are beautiful and compelling. He speaks at length - in intense close-up, of course - about what he loves about cinema and why he carried out his deception. "A true artist is someone who is close to the people and is prepared to go to the cinema with them". "And then, I come across a good man who portrays all my sufferings in his films, and makes me want to see them over and over again". Even as the jury question his every action - one accuses him of now merely playing the role of a sentimentalist - we're granted an insight into the psyche of one man and the reasoning for his peculiar actions. Again, all of this is achieved through Kiarostami's exerted control over not only the images but also the 'reality' of the court. In another of the film's famous acts of cheeky trickery, the audio cuts in and out to grant us only inconsistent hints of the conversation that plays out when the impersonator finally meets the impersonated, his hero. As Kiarostami and his camera operator observe from a distant car, Makhmalbaf and Sabzian journey on a motorcycle following the latter's release from prison. Through the malfunctioning soundtrack and voyeuristic, searching camera we're reminded that we're only watching a film, albeit one portraying a genuine, important meeting of two spiritually connected individuals. They travel to apologize to the family Sabzian misled. This leads to a moment of raw emotion and tender compassion as Sabzian is forgiven with open arms - the achievement of both real and cinematic catharsis. And then it suddenly, unexpectedly cuts to freeze frame and the credits. We're very consciously dumped right back into the real world, almost before we've had a chance to suitably appreciate what has just occurred. Kiarostami's final act of authorial control couldn't have been more appropriate.